CCC aims to explore the boundaries from which the effectiveness of a compliance management system is depending on. 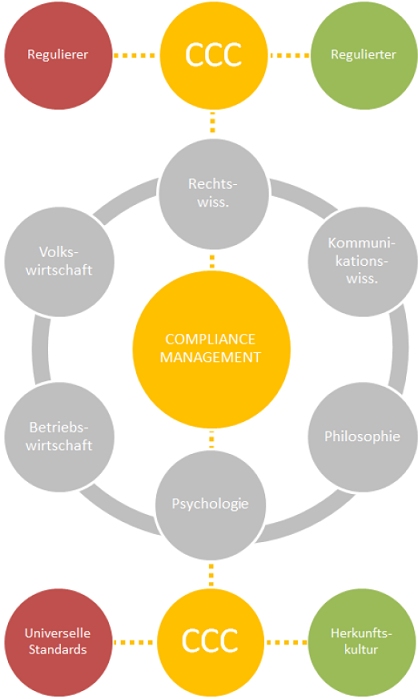 The approach of CCC transcends and defines new boundaries between the various disciplines in three respects: Compliance Management as a multidisciplinary field between government and industry: Compliance Management as a paradigm shift concerning the relation between "regulators" and the „regulated" and between cultures: Cross Cultural Compliance as a translation instance between universal standards and socio-cultural differences. The project is conducted within the Centre B / Orders in Motion at the European University Viadrina. The associated partner of CCC is the Southeast Asian Center of Excellence for Public Policy and Good Governance (CPG) at the Thammasat University in Bangkok. Prerequisite for a sophisticated corporate compliance standard is the consideration of various disciplines by exceeding their limits. For this purpose it is important to consider the disciplines of jurisprudence, business administration, sociology and linguistics. This perspectival demarcation runs between the state as a standard-setting jurisdiction and the company, as the addressee of such a standard. The compliance research develops innovative concepts, which take up the intersections between these two perspectives. Through the introduction of structures, measures and optimizations an efficient and value-based corporate implementation should be provided. Compliance solves these as fundamental considered perspectival distinctions between regulators and the regulated, and redefines them. Global companies face the challenge of implementing universal compliance standards in their worldwide group structures in order to ensure a worldwide high compliance standard. Companies often encounter in other countries social, cultural and communicative boundaries, which are setting barriers to the implementation of uniform compliance standards. Cross Cultural Compliance aims to solve and redefine two boundaries: On the one hand - on the micro economic level - the border between state of origin and appliance culture of a society and on the other hand - on the macro economic level -from the point of an international community the enhancement of universal standard regimes. Purpose of the project is to investigate in particular the third of these limits, which is currently in high motion and which has remained so far scientifically unexplored.